Nothing can put a damper on your holiday hosting schedule quite like a living room you're embarrassed to share with your guests. After all, it's hard to send out party invites when you cringe at the very thought of letting anyone through your front door. It's time to move past those doubts though, because there's no problem that can't be fixed in a jiffy—even if it's just temporarily. "Consider adding a few ottomans or stools. You can also go online and find inexpensive folding stools," Snyder points out. "After the holidays, any of these can store away easily in a closet, or leave a couple of the ottomans under your console table so that you're always ready to host another party. "If adding temporary seating isn't an option, you can always opt to host a cocktail party instead of a major gathering," she adds. "For a casual get-together, such as a cocktail party, you don't need seating for everyone. People will mingle and won't all be seated at once." 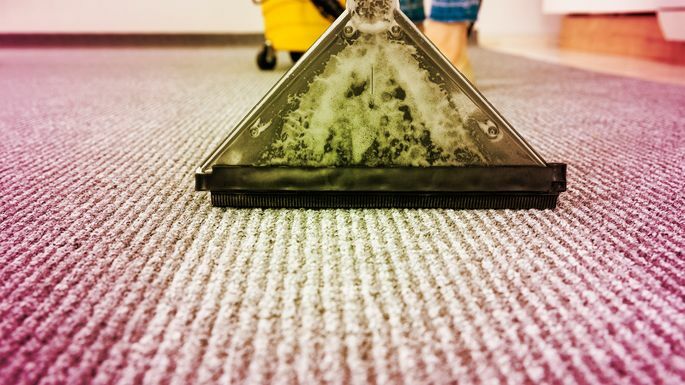 Who knows what those stains in your carpet even are, anyway? Wine? Coffee? Canine? At this point, they've literally become a part of the fabric of your home, so much so that you don't even notice them anymore. That is, unless you have a party in the works. Suddenly, they're all you can see. Don't start taking measurements to have new carpet installed just yet—Snyder suggests cleaning it first. "You'll be amazed at the result. Rent a steam cleaner from your local hardware store, or contact a carpet cleaning company and let the pros have a go at it," she says. "If that doesn't do the trick, you could purchase a large area rug and put it right over the carpet," she says. "Use the rug to define a seating area, but take care that it doesn't become a tripping hazard." Unless your house is brand-new (or maybe even if it is), there's a good chance you have at least a couple of cracks in your walls. And unless you've painted recently, there'll be smudges galore. "If you have time to hire a painter, do it! They can fix those cracks and paint away your problems," says Snyder. "If you can't do that, then it's time to get really festive with the decorations. Distract the eye away from the problem areas by creating beautiful, eye-catching seasonal decor like lights. Your guests will focus on that and won't ever notice the little cracks in your walls." "A multisize artwork gallery wall is always captivating," Snyder adds. If your mismatched living room furniture is giving you stage fright, you'll love Los Angeles–based interior designer Laura Muller's shockingly simple fix: pillows. "Unify mismatched furniture with continuity. Layer accent pillows in similar neutral tones to pull together different styles," she explains. Who knew it could be so simple? Whether the culprit is your kids, your pets, or even yourself, torn furniture happens. Thankfully, Snyder has a fix that doesn't involve shopping for a new sectional. "If the tears aren't prevalent, well-placed pillows and throw blankets may do the trick," she says. If your problem is something a pillow can't hide, however, she has another solution. "Slipcovers can work wonders," she says. "You can go right online, choose the sizes you need, and cover away those problem areas. "Be sure to follow the instructions for installation, paying attention to the tucking and pinning that will be needed to make them look great," she adds. If you have kids, there's a very good chance your living room looks a lot like a playroom, even on its very best days. Muller says there's no need to start throwing toys in the closets and under beds—just find something pretty to corral them all. "A trio of beautiful, assorted, oversized deep baskets for toys always work to keep things tidy," she says.